cover-up • Uncovers the amazing results of the CIA's Berlin tunnel operation and the remarkable progress of high-altitude spying A Look Over My Shoulder begins with President Nixon's attempt to embroil the CIA, of which Richard Helms was then the director, in the Watergate cover-up. A Look Over My Shoulder begins with President Nixon’s attempt to embroil the CIA, of which Richard Helms was then the director, in the Watergate cover-up. Helms then recalls his education in Switzerland and Germany and at Williams College, his early career as a foreign correspondent in Berlin, during which he once lunched with Hitler, and his return to newspaper work in the United States. Helms served on the German desk at OSS (Office of Strategic Services) headquarters in London; subsequently, he was assigned to Allen Dulles’s Berlin office in post-war Germany. On his return to Washington, Helms assumed responsibility for the OSS carry-over operations in Germany, Austria, and Eastern Europe. He remained in this post until the CIA was formed in 1947. During his tenure at the CIA, Helms served as a division chief; as chief of operations for Frank Wisner; as deputy director for plans (operations); as deputy director; and, ultimately, as director, from 1966 to 1973. He was appointed ambassador to Iran later that year, and he retired from government service in January 1977. A Look Over My Shoulder focuses on subjects such as intelligence collection, covert action, the uses and misuses of intelligence, and the problems secret intelligence encounters in an open society. 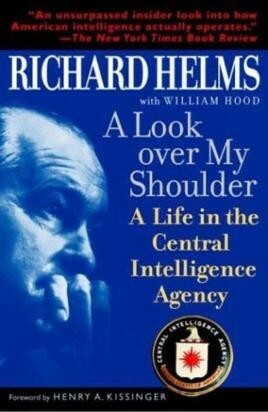 It was often thought that Richard Helms, who served longer in the Central Intelligence Agency than anyone else, would never tell his story, but here it is – revealing, news-making, and with candid assessments of the controversies and triumphs of a remarkable career.